The CAO is the giant of the group. It was established in 2017 as part of the Protecting Condominium Owners Act, 2015. This group is funded to the tune of millions of dollars each year courtesy of a monthly condo fee, or tax, assessed on condo owners, paid quarterly by their condo corporation. According to its website the CAO is a “legislative authority created to improve condominium living in Ontario”. Its mandate includes registration of all condominium corporations in Ontario, self-help resources, online training for condo directors and operation of a dispute resolution tribunal for condo residents. The CMRAO oversees condominium managers and management firms to help protect consumers. Its primary purpose is to license condominium managers and the property management companies that employ them. It has established standards and required education to obtain and maintain licenses, and soon will be implementing a process for filing and investigating complaints against condominium managers. Established in 2017 as part of the Protecting Condominium Owners Act, 2015, this group is funded through licensing fees paid by condominium managers and property management companies. Annual revenues are estimated at more than $1 million dollars. CCI is an independent non-profit membership-based organization established in 1982. Its website describes the organization as “representing all facets of the condominium community”. This rather general mandate may become less relevant in light of the newly established CAO, its mandate and standards. As the CAO grows and establishes its authority, CCI –Toronto may require some retooling to remain relevant. 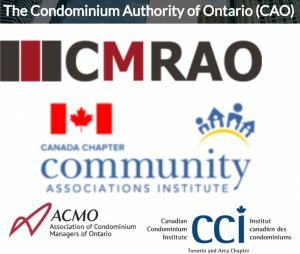 ACMO was established in 1977 “to represent the collective aims” of all Ontario condominium managers. The organization offers a Registered Condominium Manager (R.C.M.) designation for condominium managers and “ACMO 2000” certificate for condominium management firms. In light of newly implemented licensing requirements by CMRAO, the value of these programs could be on the decline. As with CCI – Toronto, ACMO may need to revisit its mandate and purpose to remain relevant. CAI is the largest member-only community association organization in the world with more than 35,000 members. The Canada chapter, established in 2017, provides resources, education programs, and licensing and credentialing opportunities to the Canadian condominium industry, drawing from resources in other jurisdictions. CAI members include condominium managers, board members, homeowners, professionals and service providers. CAI Canada offers seminars, webinars, library resources, on-line exchanges and other networking events, and conferences. Given CAI’s broad reach and inclusiveness, this organization is a refreshing change within the industry. Toronto Condo News will be monitoring the evolution of these organizations as they strive for relevancy in the Toronto Condo Community.